Welcome to our stunning villa. Re-ignite your passion at one of the most beautiful, magnificent and romantic places on earth! 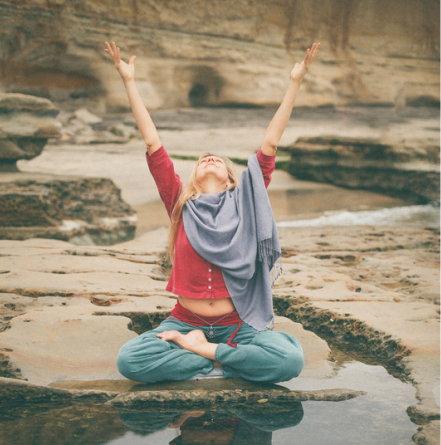 Expand your love, joy and aliveness with Tracie Sage yoga and love wisdom! 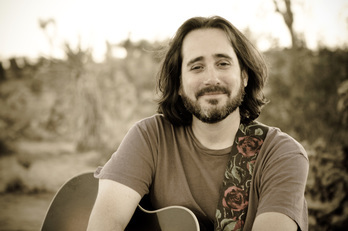 Relax into spiritual awakening with David Newman’s music and inspirational teachings! Play, laugh, explore, discover and share this adventure with other extraordinary souls! 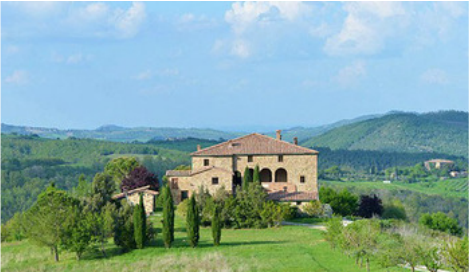 Get the true, authentic, untouched by tourism experience of Tuscany, Italy! This is a journey that will change you forever, a journey that you will never forget! 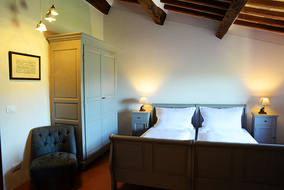 Come play, laugh, explore, discover & open to love with us in the romantic embrace of Tuscany! From beginning to end, this retreat with Tracie and David, is an enlivening and transformational Journey into Love. Your daily yoga will guide you to tune into your body wisdom and tap into the creative & free spirit of You! All levels of experience, flexibility and strength welcome. In her practical and playful signature seminar sessions, Tracie will give you the keys to lasting love and harmony that we weren’t taught in school. Tap into your own source of love, joy and aliveness. Explore useful tools and practices to create closeness & replace the most common habits that damage & destroy relationships. Learn how to resolve conflicts and co-create solutions without compromising or manipulating. Clear old dynamics or barriers that keep you from fully allowing the amazing relationship you are meant to share. Uncover and release anything that gets in the way of love! Special Guest, David Newman (aka Durga Das), is a renowned musician, best-selling author, and inspirational teacher. David guides and inspires fellow travelers through his uplifting music and valuable insights on the path of love as a vehicle for spiritual awakening. He has released numerous CDs and is the author of The Timebound Traveler. David lives with his family just outside of Philadelphia. 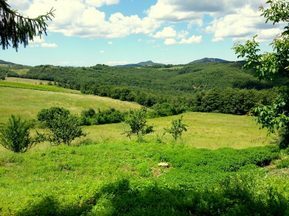 You'll be in an area of Tuscany untouched by tourism ~ surrounded by a wide and peaceful countryside with vineyards, olive groves, sleepy hamlets and wild gorges, and medieval churches. 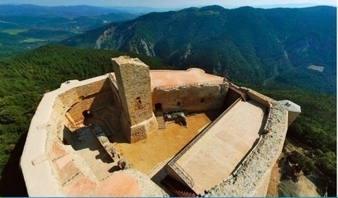 Our hosts recommend a visit to San Galgano Abbey, a mystical place famous for the ‘sword in the rock. Visit this roofless abbey to take in the magic. Swim in a river nearby or in the pool onsite to refresh and relax. Excursions to the Tyrrhenean Sea and pristine beaches can also be organized if the ocean calls you. 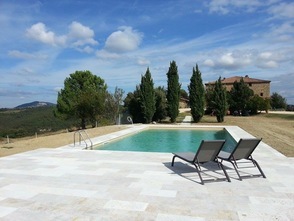 forty minutes from the famous town of Siena. 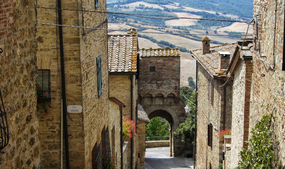 For the wine and cheese lovers, Montalcino and Pienza are must see towns. 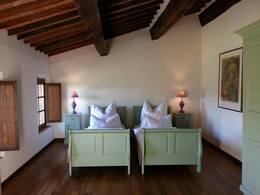 If your appetite is more for thermal baths and spas, you'll be delighted to visit Bagno Vignoni. 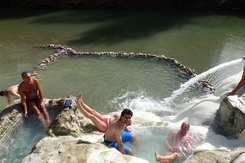 Terme di Petriolo, a thermal bath within an hour's scenic country drive from your villa. 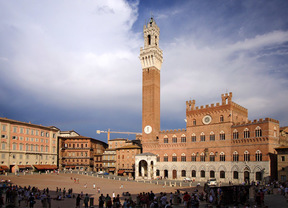 The easiest way to reach your retreat is to arrive in Florence by air, or Siena by train. Get yourself there and then the magic begins! and sharing from our hearts together. yoga, live music & inspirational evenings and your path to Love~everything you need for an experience of a lifetime. It's up to you to get yourself there and then the magic begins! Reserve your space with a 50% deposit. Payment in full is due by March 1st. Refunds are possible if your place is filled and cannot be guaranteed with cancellations after March 1st.